MSGM is known for their wild prints – from incorporating animals to geometric touches, each piece is unique and fun. While perusing the SSENSE sale last month, I found this dress on final sale! I’d never owned a piece of MSGM so I was a little hesitant to buy it since I couldn’t return it. To my pleasant surprise, it looked just as it was pictured and fit perfectly! While this particular piece is now sold out everywhere, MSGM has some amazing fall prints coming out both here and here that are definitely worth a look. I remember seeing a preview of that dress on your instagram, you look amazing in it. The print is so fab. Love this on you! I love their stuff, the tigers on the print are beyond! This dress is absolutely stunning on you – love the unique print & fun mix of colors! 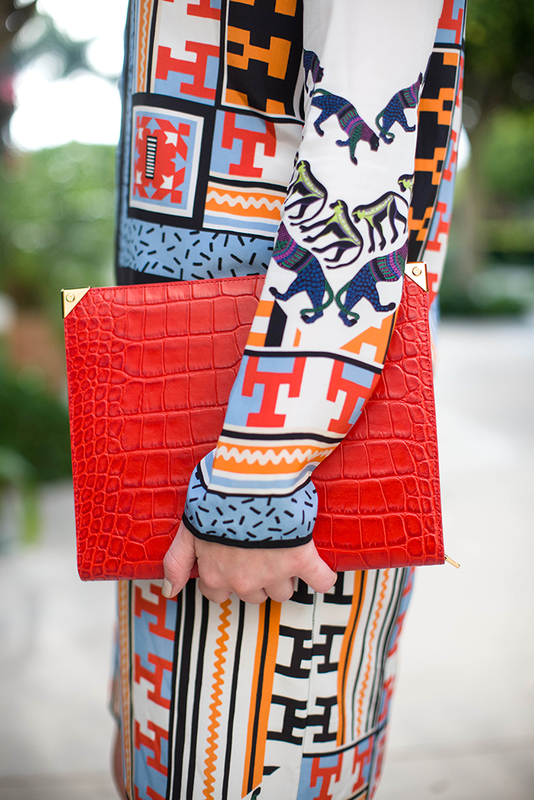 such an amazing bold graphic dress! Love that clutch too! I can’t get over the fun print on this dress! It is so unique and gorgeous!! This dress is stunning on you! Definitely a bold statement, but you’re totally rocking it! That MSGM dress is phenom! Obsessed. 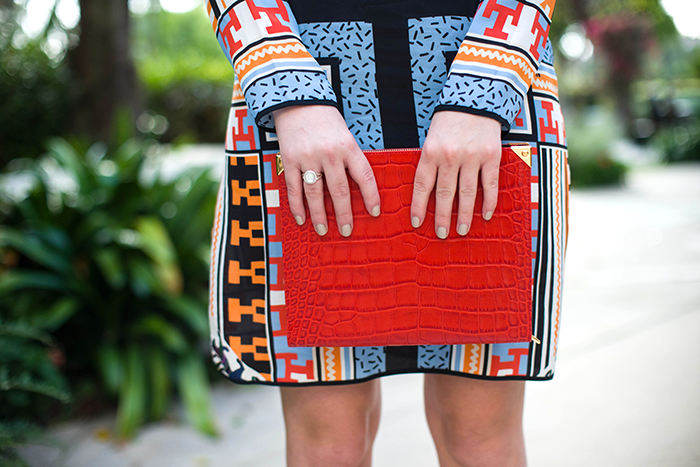 Love the bold pattern of the dress with your simple accessories! Love that bag too! Love this dress! It is such a great bold color! great dress – so unique! 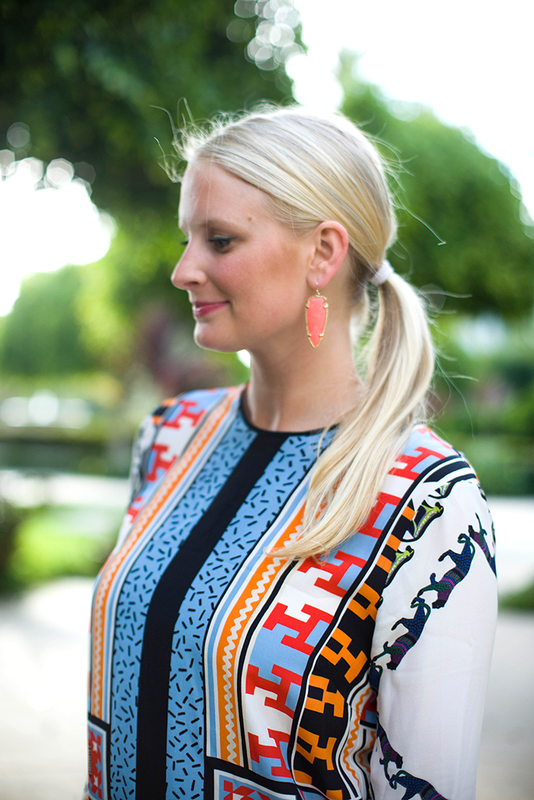 and I always love Kendra Scott earrings.. gorg! Nice dress! Thanks for sharing. i love this dress! great colors.. nice styling as well…pulling your hair back really lets you see the entire look. Love, love, LOVE this dress! Looks so good on you! LOVE your blog!! Absolutely stunning print!! This looks gorgeous on you and I love that color you chose for the clutch. So chic and elegant outfit, so in style! Such a stunning dress! I love the colors & print on you! Hi Merritt, I found you through a blog friend of mine (Jody of jodybeth.com), and I’m so glad I did. Love your style and I definitely agree with you on this MSGM dress. The print is incredible and you’re a knockout in it! Can’t wait to peruse through more of your posts! obsessed with this dress. you look so cute! can i borrow it since its sold out everywhere? haha. xo.